Chromatherapy, integrated speakers, hot zones, powerful jets, stream-flow jets, and Japanese soaking tubs are just a few of the options one can choose from when purchasing a bathtub in the 21st century. If you’re in the "less is more" camp, however, but still crave a special bathtub look and experience, a vintage cast iron tub might be just what you never knew you always wanted. 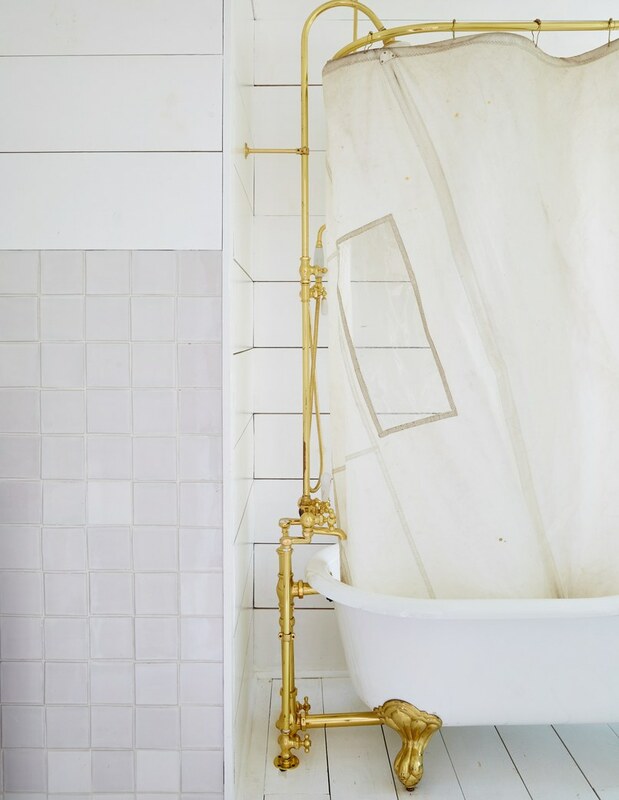 Exposed brass plumbing fixtures compliment the beauty and functionality of a cast iron tub in this bathroom designed by Leanne Ford. In Knoll CEO Andrew Cogan's Shelter Island, New York, home, the master bath features a cast-iron tub with fittings by Sign of the Crab. No detail was spared in the reproduction cast iron tub Katherine Carter used in this Los Angeles master bathroom. Since these bathtubs usually weigh in at around 300 pounds, their weight presents itself as an obvious challenge for maintenance and installation. Hull points out the other big obstacle with cast iron, explaining, “Rust is the enemy, and if the exterior coating wears out, the rust (especially around the drain) can be quite ugly.” He recommends restoring the tub with a new epoxy finish to prevent future rust, and sticking to nonabrasive cleaners (i.e., nothing with bleach or harsh chemicals that would eat through the epoxy) on the restored surface to keep it in good condition. Of course, these pieces don’t necessarily have to be vintage or antique. For someone who wants the benefits of a cast iron tub, but doesn’t want to sleuth too hard or spend time fixing it up, designer Katherine Carter recommends Sunrise Specialty in Berkeley, California, a company that has been making historically accurate cast iron bath reproductions since 1972. But for those who love the thrill of the hunt, Leanne Ford has one definitive resource: “Craigslist!” she says, immediately followed by, “Am I allowed to say that?” No one ever said finding an authentic vintage cast iron tub would be as glamorous as bathing in one.